Why not invite Posters Plus to run a workshop at your church? The best way to enthuse people about the idea of posters is to give them a chance to make their own! All materials are provided at a Posters Plus workshop, and no fee is charged. All we ask for is overnight accommodation and a donation towards the cost of materials and travel. 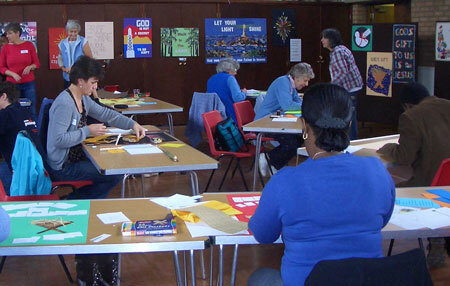 Participants at the workshops each make their own poster, using a variety of easy techniques, including cutting, tearing, sticking and unusual ways of applying paint. Everyone is encouraged to use and develop whatever gifts and skills they already have, and total beginners will discover how to make a simple, eye-catching poster. We have a great God, who inspires us to try things we never thought we could do! Visit our "Contact Us" page if you would like a workshop at your church. If you would like to find out more about making posters first, why not order the book 'Prepare the Way with Posters'? Price £8.99 (postage free in the UK).